Vacherin is not only a cheese but a french dessert that is far from being cheesy. It's a fruity heaven of meringue, cream and berries. I chose not make the classic version of meringue layers but a small one in tartlett moulds. First, I crumbled some meringues that I always have at home. It's so easy to make meringue when you have egg whites in abundance. I topped the meringues with a swiss double cream which is called "Crème double de Gruyère" - it has an amazing fat content of 45%! 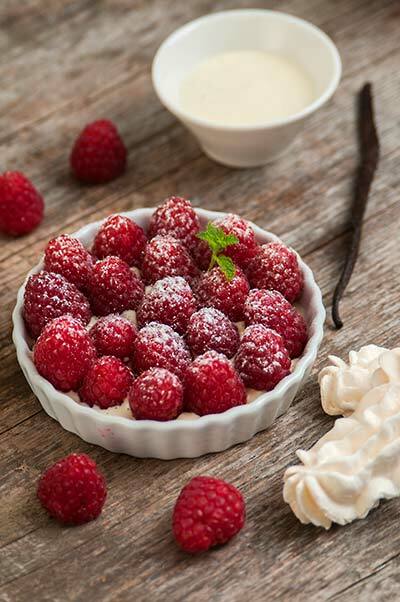 Being in the middle of summer I couldn't resist putting a lot raspberries on top of the cream. Some icing sugar on top - happy days! What is so great with this dessert: You can make a lot of variations. Meine Lieblingsvariante hat gefrorene Himbeeren und wird doppelt geschichtet. Die Schüssel dann für 4 Stunden in den Kühlschrank stellen, heraus kommt etwas Eis-ähnliches. Eine weitere Variation sind Dessertkräuter feingehackt gestreut über dieses feine Vacherin, z.B. Lemonaniskraut, Zitronenverbene, Spearmint Minze etc. Hmm, großartig. Ehrlich gesagt, hab ich vor dem Anklicken doch überlegt, wie der Käse mit den Himbeeren harmonieren mag. Über diese Version bin ich dann doch erleichtert und begeistert! Ich habe diese Gerichte bei einem restaurant karlsruhe probiert.Es war so lecker! This is a heavenly dessert. My kids will love them for their treat. Lecker! Hier lassen sich bestimmt auch andere Früchte für das Rezept nutzen. Heidelbeeren oder Erdbeeren wären da sicherlich auch eine interessante Variante.